What are detectors and why are they important? JWST's mirrors collect light from the sky and direct it to the science instruments. The instruments filter the light, or spectroscopically disperse it, before finally focusing it onto the detectors (Figures 1-2). Each instrument has its own detectors. The detectors are where photons are absorbed and ultimately converted into the electronic voltages that we measure. JWST needs extraordinarily sensitive detectors to record the feeble light from far-away galaxies, stars, and planets. It needs large-area arrays of detectors (Figure. 3) to efficiently survey the sky. JWST has extended the state of the art for infrared detectors by producing arrays that are lower noise, larger format, and longer lasting than their predecessors. 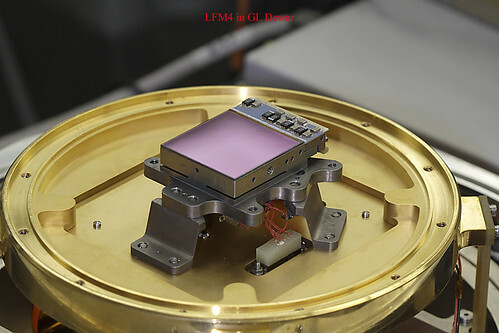 JWST uses two different types of detectors: mercury-cadmium-telluride (abbreviated HgCdTe) "H2RG" detectors for the 0.6-5 μm "near-infrared" and arsenic doped silicon (abbreviated Si:As) detectors for the 5-28 μm "mid-infrared". 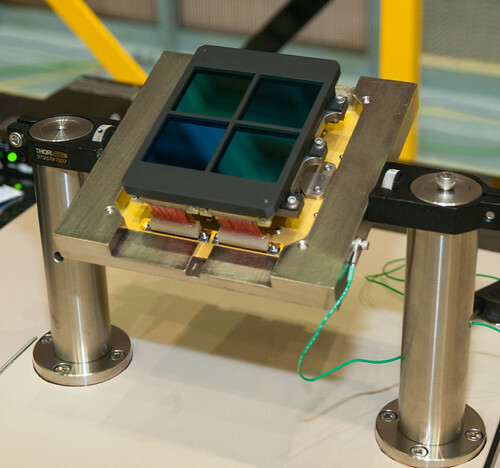 The near-infrared detectors were made by Teledyne Imaging Sensors in California. "H2RG" is the name of the Teledyne product line. The mid-infrared detectors were made by Raytheon Vision Systems, which is also in California. Each JWST H2RG detector has about 4 million pixels. 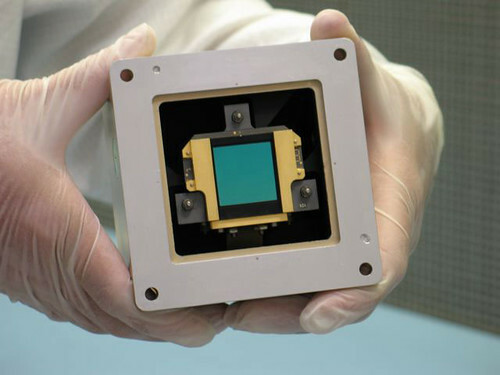 The mid-infrared detectors have about 1 million pixels each. HgCdTe is a very interesting material. By varying the ratio of mercury to cadmium, it is possible to tune the material to sense longer or shorter wavelength light. JWST takes advantage of this by using two compositions of mercury-cadmium-telluride: one with proportionally less mercury for 0.6 - 2.5 microns, and another with more for 0.6 - 5 microns. This has a number of advantages, including the possibility of tailoring each NIRCam detector for peak performance over the specific wavelengths for which it will be used. Table 1 shows how many detectors of each type are contained in each instrument. All of JWST's detectors are installed in the instruments, tested, and ready to fly. All of JWST's detectors have the same basic sandwich-like architecture (Figure 4). 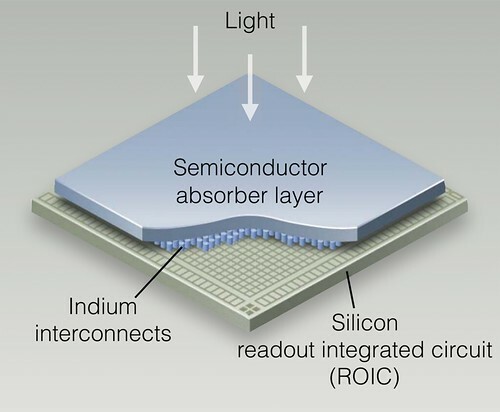 The sandwich has three parts: (1) a thin semiconductor absorber layer, (2) a layer of indium interconnects to join each pixel in the absorber layer to the readout, and (3) a silicon readout integrated circuit (ROIC) to read out millions of pixels using a manageable number of outputs. The absorber layer and silicon ROIC are fabricated separately. This separation allows for each part of the process to be carefully tuned to the materials that are used. Indium is a soft metal that deforms under moderate pressure to form one cold weld per pixel between the detector layer and the ROIC. To increase mechanical strength, the detector vendors flow a low viscosity epoxy resin between the indium bonds during the latter stages of "hybridization". How do JWST detectors work? The first step in the detection process is the same in the near-IR HgCdTe detectors and mid-IR Si:As detectors. An incident photon is absorbed by the semiconductor yielding mobile electron hole pairs. These move under the influence of built-in and applied electric fields until they find their way to where they can be collected. How are JWST's Detectors Used? It is possible to read the pixels in a JWST detector more than once before resetting them. This provides several benefits. For example, it is possible to average multiple non-destructive reads together to reduce the read noise compared to doing only one read. Another advantage is that by using multiple samples of the same pixel, it is possible to see the "jumps" in signal level that are the tell tale sign that a cosmic ray has disturbed a pixel. Once it is known that a cosmic ray has disturbed a pixel, it is possible in ground based processing to apply a correction to recover much of the scientific value of the affected pixel.